All physical activity requires energy and that energy comes from burning phosphates, ATP (adenosine triphosphate) and converting it to ADP (adenosine diphosphate). It is during short term intense activities that this conversion happens. Once the ATP has converted to ADP the body draws Creatine phosphate from the deep skeletal muscles to replace the used phosphate. No carbohydrates or fats are used in this process and since oxygen is not used in this it is anaerobic. This energy source usually only lasts up to 10-seconds, also there is a limited amount of ATP and Creatine phosphate so fatigue sets in quick. Now for the Glycolytic energy system. This system produces energy for 30 seconds to 2 minutes. 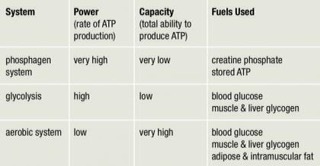 This system refuels your ATP by converting sugars in the system (gained from carbohydrates) to energy. Not a lot of energy is given off with this conversion but you do get the energy faster. The Aerobic system tends to be the most complex, and is dependent on oxygen. The metabolic reaction to oxygen in the system is what creates the largest supply of energy in the body. On the flip side to this is the slowest method of refueling your ATP. It is the aerobic system that will also break down the fats as fuel. This is a long and complex system and will be fully covered in later posts. Want to see how I’ve progress? My Fitness Journey.